It seems like no matter where we turn, there's yet another story that is rooted in the pain of black women. There is a rising epidemic of black mothers dying in childbirth, due to medical racism, and black women are still being pigeonholed within dangerous tropes, especially when it comes to saving us from our own racism. Our cultural narratives are deeply connected to the oppression that black women face — but despite all of the strife we have to wade through, we continue to triumph. 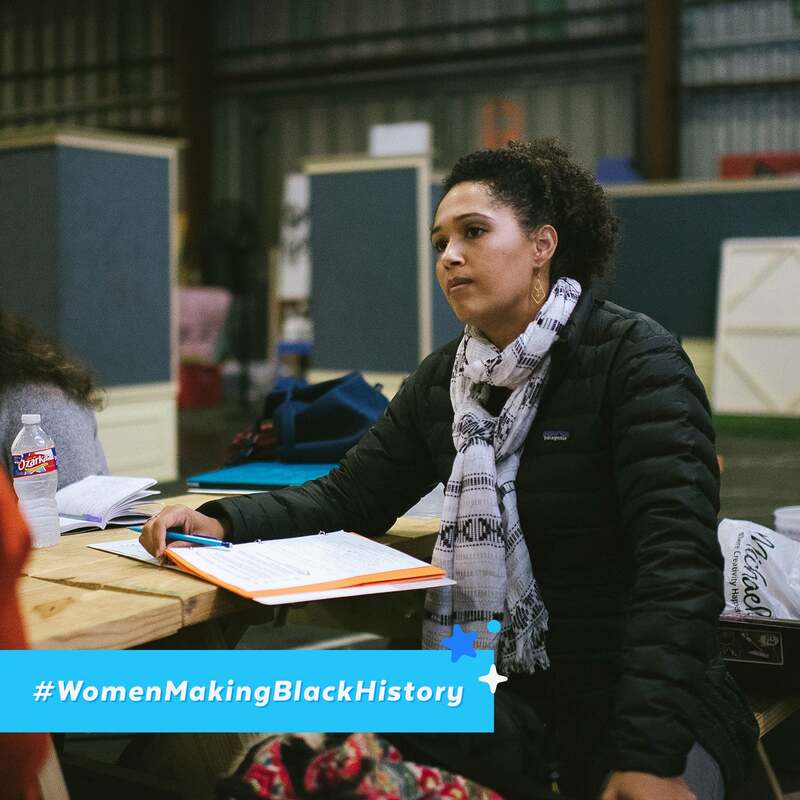 Despite the setbacks, we're beginning to see black women take center stage in the work that they do; they're being celebrated and making space for their own victories to be acknowledged. Writers, actors, politicians, musicians, public figures, and intellectuals are emphasizing their identities as black women and shifting the focus to the importance of representation in fields where these barriers are still being upheld. With Black History Month upon us, there's no better time to celebrate the women who are working to change the narratives that have been given to us. Zoey Martinson is one of these women making space for change. Martinson is a woman who wears many hats; she is a New York-based artist, director, and producer who holds an MFA from NYU. As coartistic director of Smoke & Mirrors Collaborative, Martinson utilizes art to explore identity and activism through the nonprofit production company's creation of original, independent plays for IRL and the web. Her work in activism stems from an important place: the need to give back. "I worked where the need was and how best to serve that need. With art, because of that background and how I was raised, the stories that I was drawn to tell are pulled from social justice," she told me. The importance of her work has been acknowledged over the course of a career that has spanned over a decade; last year, she was recognized as a 2017 Artist as Activist Fellow, focusing on racial justice and mass incarceration. Her play, Olityelwe, tells the story of "music, dirt, and dreams of modern South Africa." It centers on the deep love between two close friends and "the humor and the hope that they find in the face of loss" amid Africa's HIV/AIDS epidemic. Martinson also cocreated and directed Skype Duet, an intercontinental and international performance piece that won the 100 Grand Award at the HAU2 Theatre in Berlin. She shows no signs of slowing down. Working on Olityelwe gave Martinson the space to learn more about merging her art with a passion for social justice. "In research for the production, I immersed myself in the world of the play . . . I wanted to activate that space in hopes of creating a dialogue [and to] use arts as a path to empathy. The result was more than expected," she said. "I was drawn to the actual rhythm of the world to influence the heightened moments of poetry. I had never seen a play combine poetry and gumboot rhythms. It was exciting to play with the form. I was gifted a phrase from my mentor: 'Let your curiosity outweigh your fear.' I think of that constantly when trying to activate a space for people to reflect on the issue the piece deals with." In fact, storytelling itself is a major theme in all of Martinson's works. But it was in working on Olityelwe that she was able to explore that on a broader scope, specifically in integrating the inspiration of a place such as New York City. "New York is a wonderful playground for an artist, but sometimes you feel like you might be preaching to the choir," she told me. "With Olityelwe, I was introducing a world people might have heard about, but they've never spent some quality time sitting in the living room of an informal settlement or shack. There was something radical in the trust people gave me to tell their stories." Martinson also lists important historical figures as inspiration for her work. Among them are Fannie Lou Hamer, Michelle and Barack Obama, and Gloria Steinem. Martinson also finds importance in centering significant social justice issues — such as immigration, prison industrial complex reform, refugees, women's rights, and Black Lives Matter — into her work. Consumers are noting the responsibility that artists have to speak on these issues with their works, but the inclusion of this only deepens the complexity of the works that they are presented in. With the integration of these complex issues into the arts, audiences are presented with a richer layer of media to enjoy. "There was something radical in the trust people gave me to tell their stories." But when it comes to her work as a public artist, there's so much more that goes into production than inspiration. Community, as Martinson says, is especially notable. "I'm often doing grassroots work [mainly in the arts community in New York City], so this is especially important to me. But the importance of community in my work can be done with doing things like pay[ing] attention to ticket sales and doing outreach to ensure access." Inspiration, of course, can only go so far. When Martinson feels discouraged or burnt out, it's re-energizing herself through self-care practices like yoga and reading poetry that help her get back on track. But for black creatives who are just beginning their journey, Martinson encourages them to keep pushing forward: "Keep doing it, keep showing up, and don't take any of the nos personally," she says. So what exactly can we look forward to seeing from Martinson in 2018? A lot. She will be directing the #HashtagProject, "a theatrical interactive VR piece exploring online extremism" that will be presented at the Transmediale Festival in Berlin, and collaborating with artists including Lianne Arnold, Xinyao Wang, Jonathan Martin, and Dara Hamidi. She will also be creating and directing The Black History Museum According to the United States of America with Here Arts Center in NYC to explore "black bodies in relationship to American capitalism." Martinson will also be acting as playwright to The Alien Nation, a culturally relevant play that follows a Dreamer who "finds herself stuck in the US immigration system as she fights to claim her place in the only country she has called home." And, finally, she will be developing a pilot set in Accra, Ghana. There's an excitement in the air for the potential from Martinson's future projects. Her work is needed now more than ever.